Retro Perler Beads (aka Melty Beads) are coming back into into geeky fashion. Now that I'm older and I can get past the fasination that it melts together woot, but now am more interested in making more retro looking art such as Pixel Art! I worked on making an outline for a Bow in some punkish coloUrs of Red and Black. I work on making an outline first on the grid (it's got lots of pegs to hold the perler beads in place) and then I go fill in the main coloUr. Yeah Yeah the picture isn't of the outline because I acidently knocked into it and half my piece came crashing off. Time for the heat which comes in the form of an iron. The iron will melt the top layer of the beads which will fuze together as it cools. TIP: Do not use the parchment that comes with the perler beads, it's probebly folded and those creases will show on your melted piece. TIP: Melt both sides of the piece. This will create durability. If not, it may snap easily. While the piece was still hot I created a curve on the piece by forcing it to cool on a curved surface. I do not recommend using your leg as you may burn yourself. 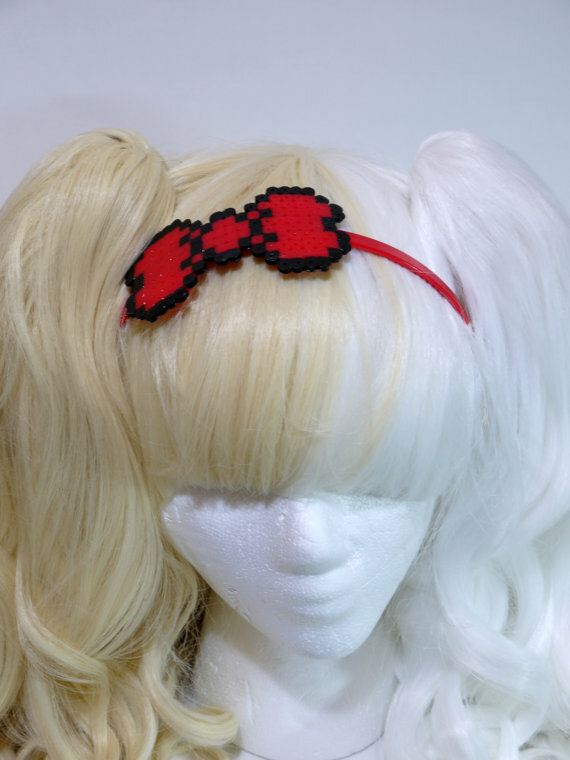 Vola, I glued the Perler bow onto a headband off centered and now it looks like a HelloKitty Bow. Just now need some cat ears. I really like this, you should sell these on Etsy and at the conventions. Awesome that is cool how you did that! Do you still make these? I would love to buy one!